Why Cloud POS systems Dominate Traditional POS systems? What all things strike your mind while you plan to upgrade your restaurant experience? You would say investing in the perfect POS system would be the one stop solution as to meet the growing industry demands. Isn't it? But you might forget along the way that investing in a POS system is a one-time investment and needs to be paid attention while you choose the POS system. You need to identify the most suitable POS system for your restaurant which can perfectly cater all your restaurant needs and enhance the customer experience thereafter. 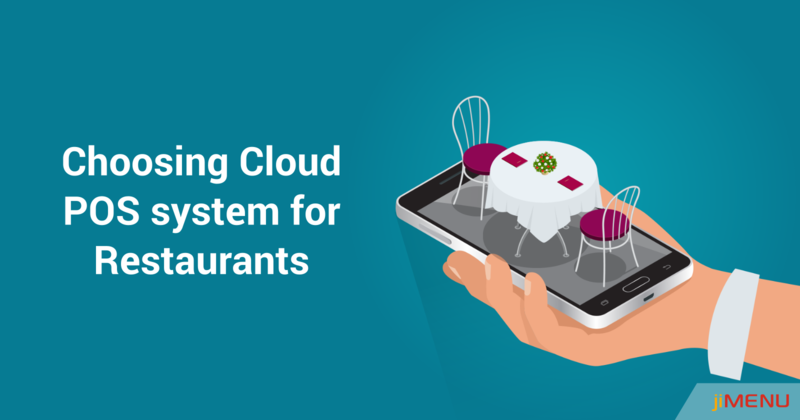 And while you step out in the market, you need to choose either cloud POS or a traditional POS system for your restaurant. Want to know in detail about which POS system performs well and is more suitable for your restaurant? Let’s get a quick overview of all of them. Traditional POS system, also referred to as legacy POS stores data on local servers and is built upon the traditional client-server architecture. No doubt, these systems dominated the restaurant industry for a very long period earlier, but it does accompany problems like data losses, security issues, accessibility issues, and a lot more. Data losses: As the customer data is stored over local servers, there are probable chances of losing data in case of any data breaches or other failures. Higher costs: Deploying a traditional restaurant POS system is not at all easy, the complex hardware demands huge expenses during deployment. Maintenance: Further maintenance and repairs of these systems are not at all cheap, and they demand a serious engagement of IT staff at all times. Unlike the traditional POS system, cloud POS system, or cPOS system stores the complete data over remote servers while keeping the data safe at all costs. They have no chances of data losses, data hacks, or any other sort of security issues, rather they can easily integrate with your customer relationship management, inventory management, or loyalty management. Enhanced Security & less maintenance: As the complete data is stored over the cloud, your data stays safer and away from the hands of hackers. Moreover, any required updates are carried out in real time, it doesn't need your involvement to carry out updations manually. Real-Time Updates: Carrying out updates and other modifications in the traditional system would demand human engagement to manually update server. Isn't it? Going for a cloud POS system lets you carry out the updates by itself and lets you stay updated with the latest version of the software. No specific hardware requirement: Accessing the restaurant portal doesn't demand a specific PC, rather you can easily access even from a tablet or a smartphone too. This helps in saving your time and makes the processing a lot simpler for you at all times. Remote Accessibility: As the data is stored over the cloud, you can anytime access the data from anywhere. You don't need to be physically present in that place, rather you can analyze your restaurant sales reports, or any other relevant information from far off place too. Cost-effective: Cloud POS system is a one-time investment offer which you can enjoy on a life long basis without any maintenance costs or any other formalities in future. With such a stiff competition in the food industry, it becomes essential that you hit the right vendor while you are looking for a POS system for your restaurant. Isn’t it? It might not be easy for you to choose the suitable ones, so take enough time, carry out a deep research, and then finalize your decision. If looking for the most budget-friendly and reliable POS system services, you can rely on jiMenu. jiMenu offers the most trustworthy and superior quality services which can help you in taking your restaurant business to the whole new level. Still not convinced? Get in touch with us and give us a try!